Found this one in my local country store’s cooler while picking up pizza the other night. I had sampled it at the brewery this Summer but never bought a bottle so decided to grab a single. 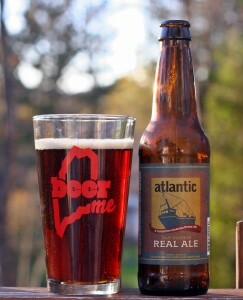 Atlantic also owns Bar Harbor Brewing so it is interesting that each has a brown ale in the lineup. Atlantic sells 6-packs while all of Bar Harbor’s beers are sold in bombers and it is apparent the recipes are different as well. The Bar Harbor Thunder Hole is a complex brown ale while this one is fairly simple. Color is a deep red but not quite brown with minimal head and almost no retention or lacing. Aroma is typical of a brown ale with plenty of malts. Taste is solid but nothing special and not as good as brown ales from Sebago, Smuttnose or even the option from Bar Harbor Brewing. Overall this is a decent beer that is certainly drinkable but nothing that stands out in a crowded field of brown ales. Brewers Description: A good, clean nutbrown ale with a malty body. This is our most popular ale due to its smooth and malty flavor. We use a mixture of pale, crystal and black malts in this one, and our primary hop is Target, though we also add some Whitbread Goldings Variation as well. The Real Ale is best fresh, so fresh in fact, that it’s great right out of the bright tank.